We've got some delicious new hot cross bun flavours to try this Easter. Our Extra Special hot cross buns are available in four flavours for £1 a pack – Extra Fruity, Chocolate chip, Fudge with pieces of sea salted fudge or Bramley Apple and Cinnamon. They've been created and developed by a supplier in Sheffield who create a variety of products for us. There can be quite a debate about whether or not hot cross buns should be available all year round. I think there’s definitely a call to have them all the time for people who fancy tucking into them, but it’s nice that we bring in other flavours around Easter time and give them the focus they deserve. I think that bringing in more flavours and varieties makes it more special. We have two products that are available year round – the Asda six pack and the Extra Special four pack. You can also pick up a pack from our stores with a bakery, which are baked from scratch in store and crossed by hand – we sell around 10 million packs of these a year! It's a personal choice for our customers, so we also sell mince pies all year round so you can get them if you want them – but if you want to be traditionalists and wait, you can! Our new Bramley Apple and Cinnamon flavour has been really popular this year – it's my personal favourite as I'm not a big fan of dried fruit. It’s still fruit and spices but it’s a bit different and the fruit in it is super-soft. I love mine toasted with lots of butter, but I also spotted a recipe for hot cross bun bread and butter pudding so I think I might try that for Easter – the perfect decadent treat! I’ve also heard of people having cheese, like Wensleydale, with their hot cross buns as you would with fruit cake. However you want to do it, no judgement! If you're not a fan of spiced fruit flavours I'd definitely recommend giving our new chocolate or fudge flavours a go. These alternative sweet flavours are becoming more and more popular – it’s about offering something for everyone so that you can still get in on the hot cross action even if you're not a fan of those traditional flavours. We've also got a Free From variety. They're created without gluten, egg and milk, but they're just as delicious – packed full of currants, raisins, sultanas, orange and lemon peel. They're suitable for vegans too. As a product developer there's not really such a thing as a typical day. On one side we’re looking at new products – looking well in advance at trends and things customers might like to see on the shelves, and then working with suppliers to get those products to launch. And on the other hand, we’re also focusing on our existing products – being the go to people for any product queries and making sure the products are as good as they can be. We’re about to start reviewing Easter 2019 and once it's passed we'll be looking at what went well and kicking off our plans for next year's range, looking to build on what we have this year. 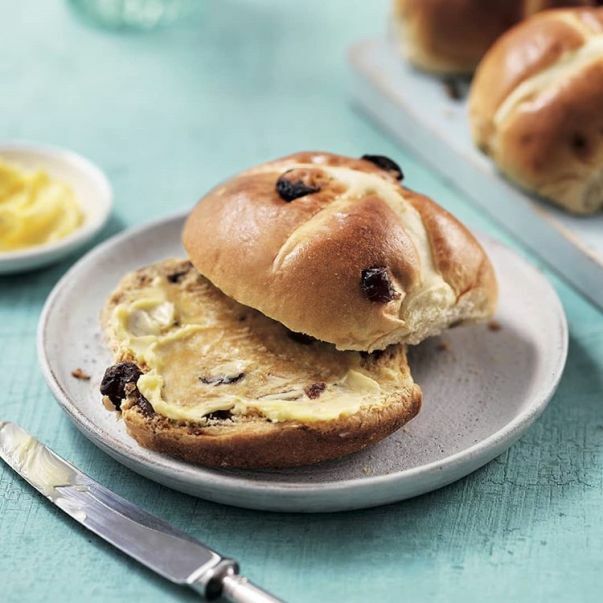 Next year we might decide that we’re going to push the boat out and try something completely different – so keep your eyes peeled for more hot cross bun flavours next year!